Thanks for entering the giveaway, everyone! Congrats to the lucky winner, I’ll be sending the makeup bag off today or tomorrow! For the rest of you, I put together a tutorial so even though you didn’t win, you can make your own! That’s almost as good, right? 4.5″ tall, 6″ wide across the top, 4.5″ wide across the bottom, and 2.5″ deep. 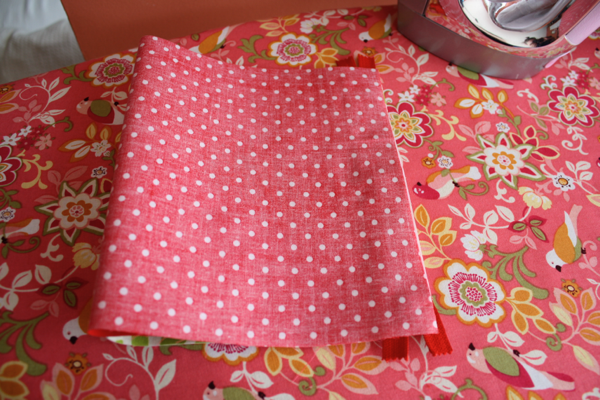 Start by applying your interfacing to the back of your outside fabric. 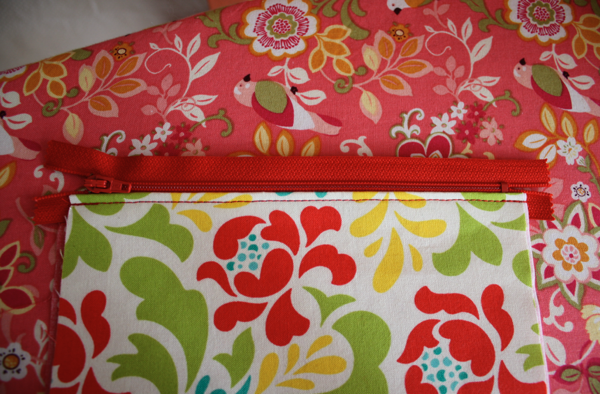 Then using the same technique from my cosmetic bag tutorial, sew the zipper to one short end. 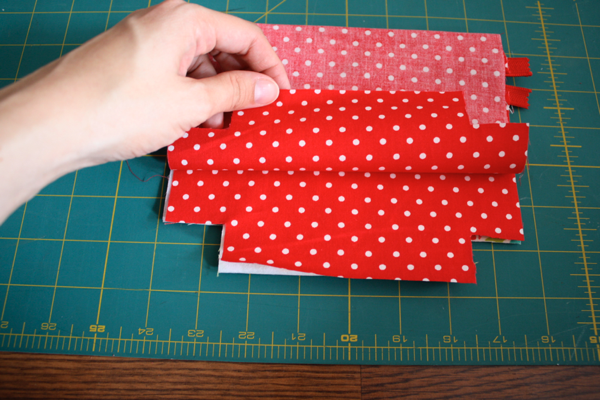 Fold the sides back and press flat. Top stitch along that side. 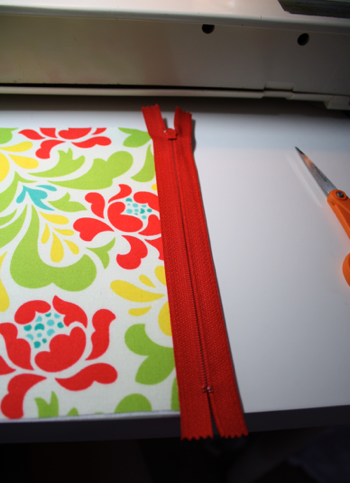 Fold the outer fabric up so the bottom is even with the other side of the zipper. Flip it over and do the same to the lining piece. 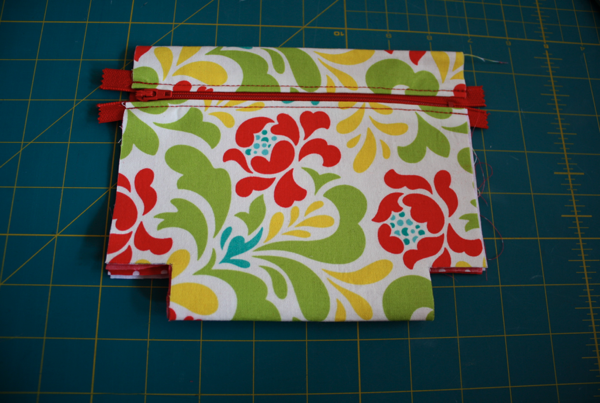 And sew the zipper along that side. Turn it right side out and press along the zipper. Top stitch. 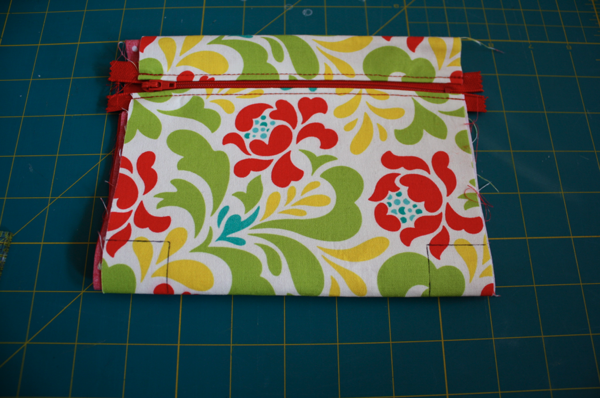 Decide how much bag you want above your zipper and measure to make sure it’s straight. I left about an inch. 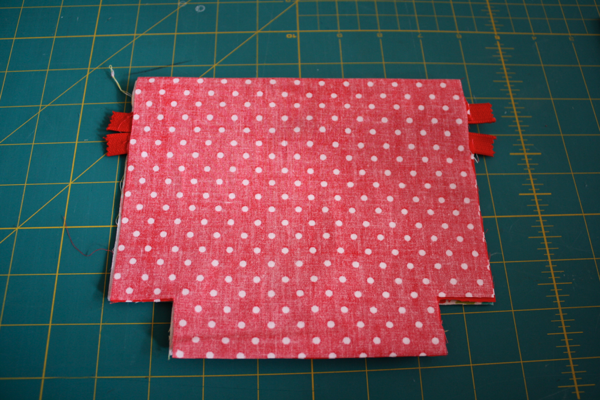 Then at the bottom, make a square, measuring 1″ from the bottom and 1.25″ from the side. Now turn the bag inside out. I don’t care how hard I try, I can never make my inner fabric the exact size of my outer fabric, so I decided to use it to my advantage. 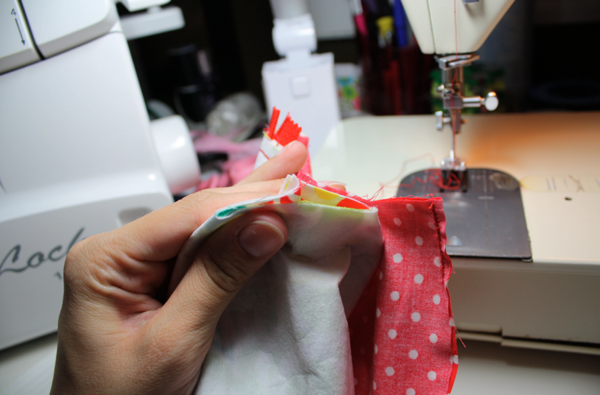 Cut the lining along the bottom, make it 2 pieces. 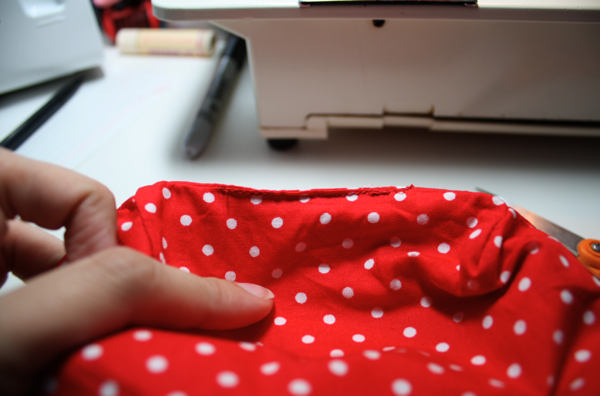 Sew along the bottom you just cut, leaving a hole about 2″-3″ in the middle to turn the bag through. 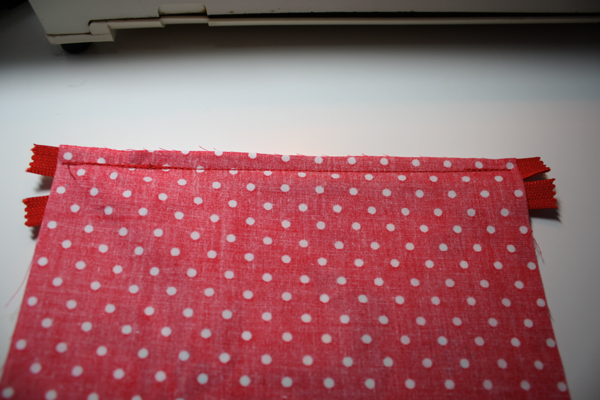 Then sew down the sides with a 1/4″ seam allowance, stopping 1/4″ from the bottom. 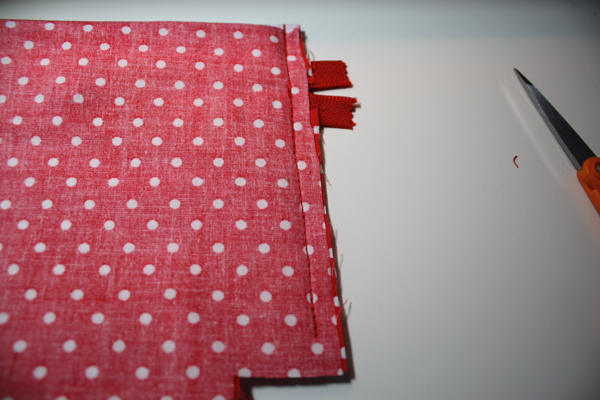 then the inner piece, and holding them together, sew closed with a 1/4″ seam allowance. 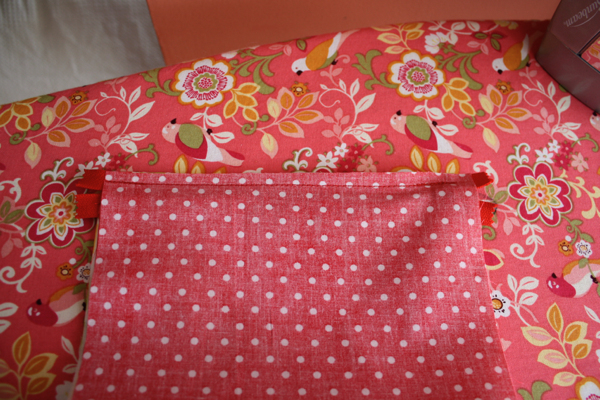 They’ll be sewn to each other, which will help hold your lining piece down inside the bag. 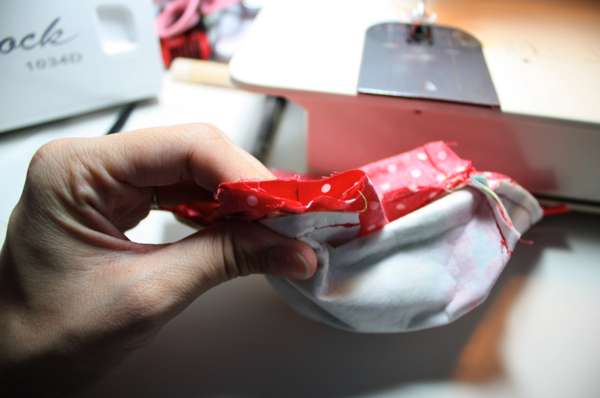 Then turn the bag through the hole in the lining, poke out your corners, and sew the hole closed. That’s it! They take me about 30 minutes to make, start to finish, and sew up so nicely! Enjoy! Great tutorial! Thanks so much for taking the time to do this for us it is wonderful! I am so excited to get my bag in the mail!!!! Thanks for the great tutorial!!! I posted it in my blog (under the Tutorials page). Hope to make one soon. 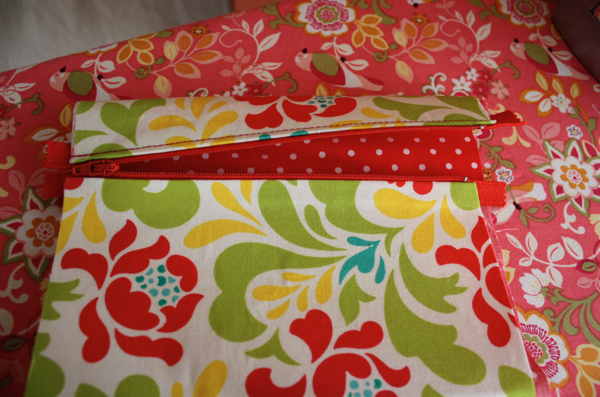 I adore the flowered fabric! Do you know who makes it? Cute bag! What are the finished dimensions? Where did you buy that beautiful pink bird fabric? I love it! Thanks for offering these tutorials. I found this on Pinterest & thought I definitely better try it. 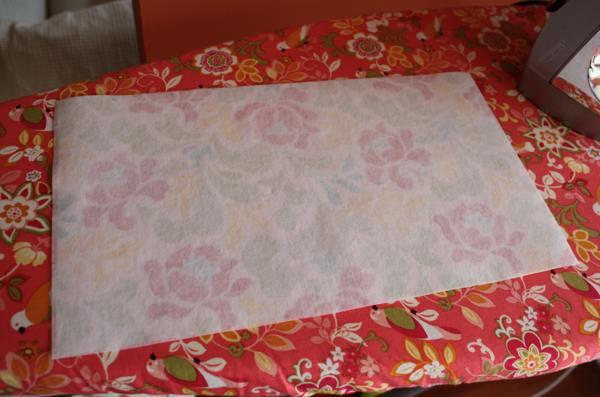 I’ve just began sewing & got my first sewing machine. Thanks for this tutorial!!! I can never get the lining the exact size too! Maybe I am just really dumb, but I have been working on this tutorial for HOURS and have not been successful. If you took the pictures in a way that showed both the lining and the outside fabric so I knew where they were in relation to each other I think that would help a lot. It is a really cute bag, but I am having an extremely difficult time figuring it out. 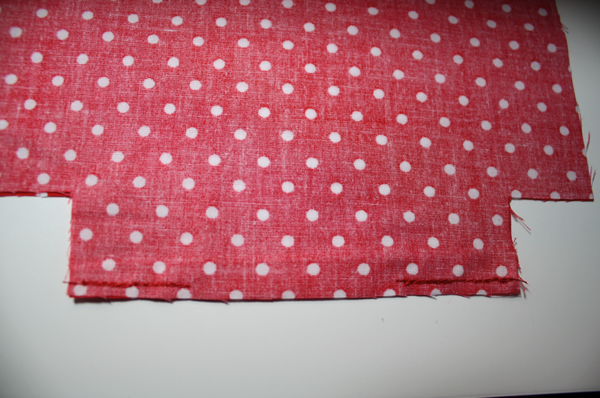 i am in love with this fabric. who makes it? i neeeed it for my kitchen curtains! 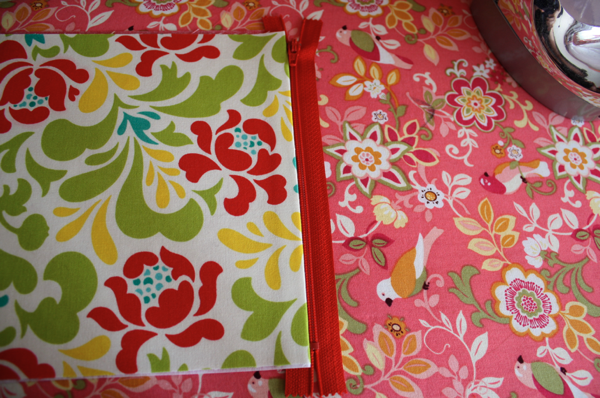 I’m also confused about the lining vs. the outter fabric when it comes to cutting the lining and then sewing the corners. I agree with Jess and Nina, that this part is quite confusing and the photos seems to almost be missing a step. Since Nina’s post was back in September and there still hasn’t been a response, I’m guessing we won’t get one from Sew Like My Mom, but has anyone else actually made this using this tutorial that could help clear things up a bit? I just made the bag. 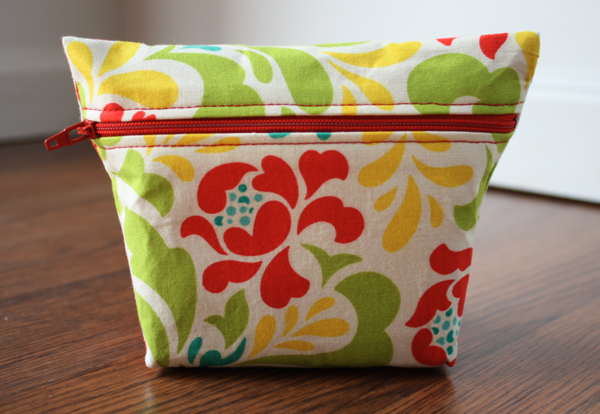 If you look at the tutorial for the cosmetic bag, like this tutorial recommends, making this bag was much easier for me. And the comments above were helpful, too. The only thing I will do different is make the length a couple of inches longer. So should the the lining be unfinish- or raw edged on the interior? Wow, love this bag! So thankful for Pinterest that I stumbled across it and your site! I would be honored if you would consider uploading a photo of it (and any other sewing pattern or tutorial you might have) into SewSet, an on-line sewing pattern & tutorial search engine. I would love for others to be able to find it when looking – amazing! I love this! I made a cuple for little gifts. Thanks for the tutorial. The bag comes out really small. 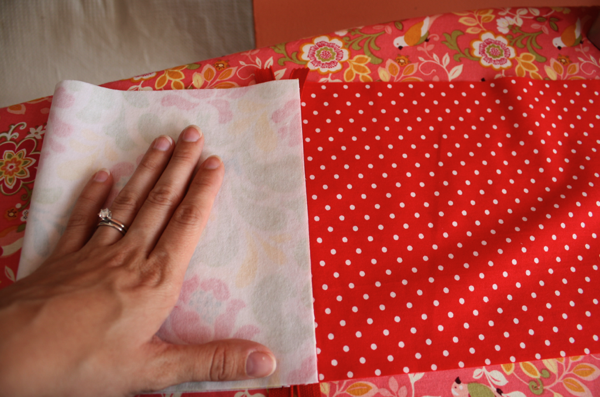 I think there is no need to cut the squares at the bottom of the bag, you can sew the bag just through all the border, and then, from the inside fold a corner, sew to give the depth of the bag and cut the excess. Very clear tutorial, I love how you end up with a purse that is neatly lined. 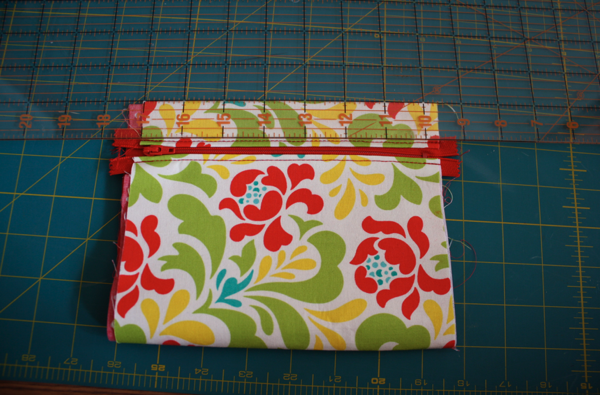 I used your tutorial to make a wristlet, without the boxed corners but with a wrist strap. Worked well! 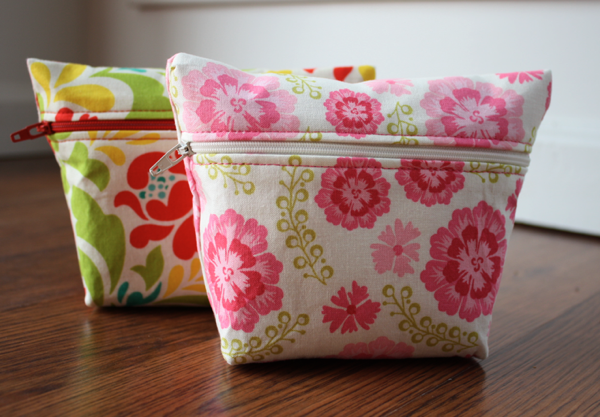 The perfect make up bag – just the right size. Can’t wait to make it. Love this bag. I think it’s great that you gave it to us and can’t wait to start mine. Would like to have a copy of pattern & tutorial. Thank you your tutorials are great, I’m hoping to share them with only those that come and stay with my friend and in a respite care in our home, to be able together or help do craft and rest would be of real benifit. Most of all they will know they are loved it is only on short time staying and perhaps revisits. Is there a video? I’m so confused on the outer and the lining. I’ve tried sewing in different ways but I feel like there are pictures missing. 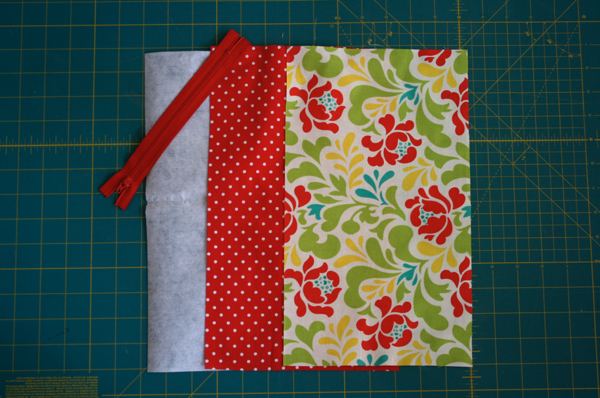 I’m getting lost between the cutting of the bottom and the corners… I’ve made many similar cosmetic bags but I thought I would try this. Please help.